REVIEW DELIDDING + LIQUID METAL. IS IT WORTH IT? Discussion in 'Overclocking & Hardware' started by Ratzz, Aug 23, 2017. The short answer is yes. Keep in mind though that delidding voids your warranty. This is basically a little spiel to demonstrate the effectiveness of delidding a Kaby chip and relidding with liquid metal. I've done quite a few(dozens) of these now, its pretty much the first thing I do to a chip, before even trying it at stock usually. I admit to having been a doubting Thomas at some point, it was my opinion that all brand name TIM was pretty much equal. I stand by that opinion for IHS<->heatsink, but when delidding, the first time I used liquid metal was the end of using anything else under the IHS. It is just that good. I'd attempted to make a video of the entire delidding process. I was quite proud of myself, kept it logical and managed to not say ummm too many times. It took 40 minutes to convert a stock, very hot 7700K into a delidded beast, fitted and overclocked. Then I discovered my DSLR only takes 20 minute videos.. oops !! So a video will have to wait for the next chip I do. Nobody wants to see half a video..
Before and after delidding, I ran a few benches on the same gear to compare apples with apples. The bench consists of an Asus Z170i Pro Gaming, a single stick of Trident Z (8GB @ XMP 3733), a Silverstone 750W bronze PSU, a cheap SSD running Win 10 Pro, and a 120mm AIO (Corsair H60) with one fan at default speeds. I've also put a 120mm Fractal case fan over the board for the ram and VRM's, since there is no airflow on an open bench. 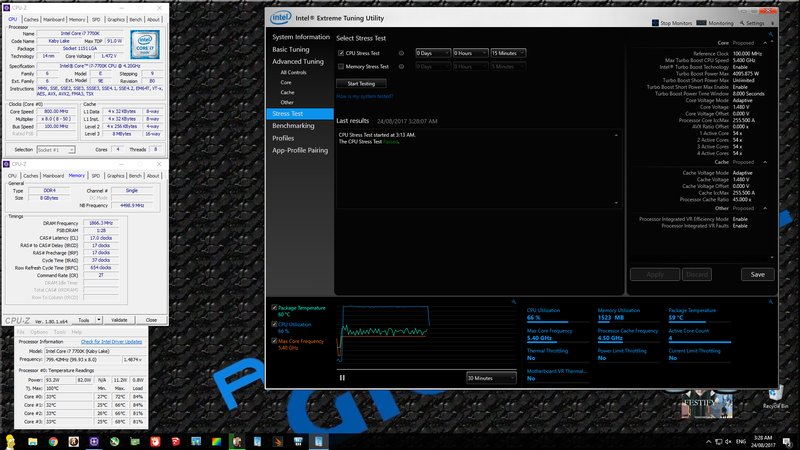 I've used a little 2GB Asus fanless GT710 for the GPU, just to avoid using the IGP more than any other reason. This chip belongs to Juzz86. 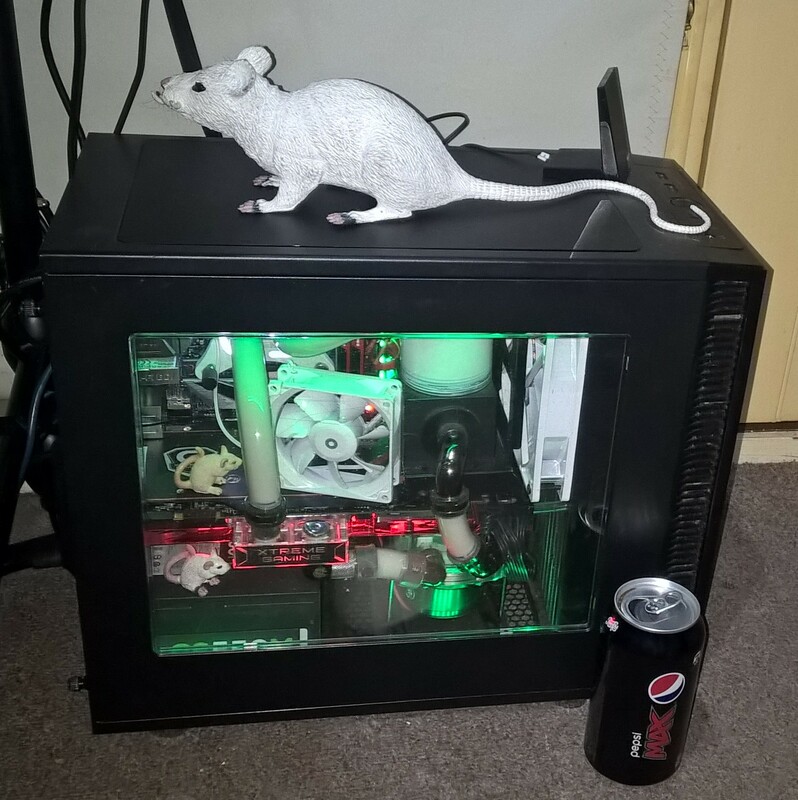 He just wants a 5GHz daily gamer, but the chip is way too hot for that, without delidding. All of the screenshots are 15 minutes of XTU stress test, with no AVX offset. Ambient is 19.3°c for all runs (heated room). I've used Thermal Grizzly Kryonaut between IHS and water block, and Thermal Grizzly Conductonaut for the delid, between the CPU die and IHS. Metal contacts under the IHS were protected using Liquid Electrical Tape. The IHS was reattached with a thin smear of ordinary bathroom silicon on each edge (after first removing the original adhesive). So for reference, on this particular board, with this cooler, etc.. I began by running the stock chip at 5GHz, looking for the lowest volts it would pass XTU for 15 minutes with. That turned out to be a disappointing 1.3v, and temps are way too high for that voltage. I thought I would push it along a little, and see how high I could make it go without it exploding. I experimented with multiple voltages, this is the best I could do to get these speeds. I did get about 8 minutes into a 5.3GHz run until the test failed, at 1.5v and with temps in the 90's on all cores. At no point did the CPU throttle though. OK, so we have a reference set. Now, delidded. Still with all factors identical, apart from the delidding. I started with the 5GHz/1.3v run as before. 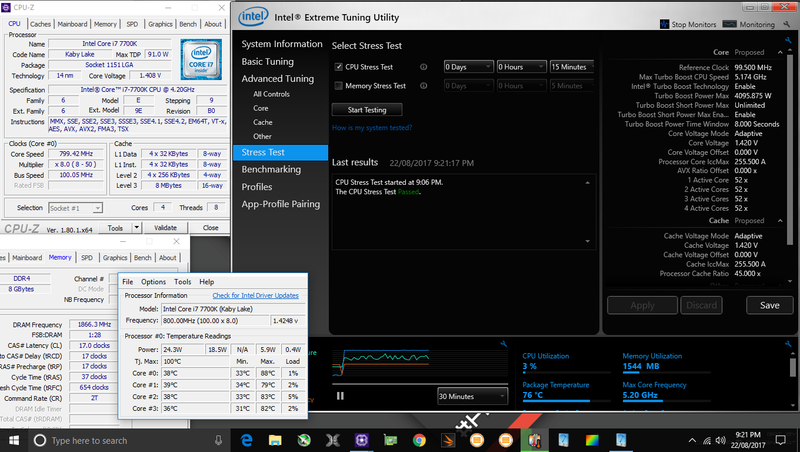 So now to try for 53x, which although I could get running, would not pass 15 minutes of XTU and was hitting temps in the 90's across all cores without delidding... so I don't have a result for the stock chip at all. Note that I was pushing 1.5v into that effort too, XTU just crashed instantly the stress test started with any lower volts than that. I did try 54x, also @ 1.48v, but it crashed 11 minutes into the 15 minute stress test. Temps were ~75-85°. no throttling. I believe that if I were to stick the chip into my good rig, with a better mobo and moarad, I could have got the temps down another 5° and easily made 54x. I may even try later... The Z170i Pro Gaming isn't a bad board, but its a weakling compared to my Z270i Strix, and of course a custom 280mm loop with a Raystorm Pro is going to cool better than a H60. Remember, all of these benches are done with a pissy little 120mm H60 with fan and pump speeds running at default. EDIT: I did exactly this. A screenshot of the chip passing XTU @ 54/45x can be found in post #9. Another screenshot of the chip passing XTU @ 54x101/45x101 can be found in post #25. That became 5445MHz, although for 54x101 I would have expected 5454 just calculated mathematically. Another thing to note here: With the stock chip, I spent some time getting the best volts/overclock. With the delidded chip, I simply duplicated everything. Justin will discover that he can get these clocks at lower volts as well, I just didn't try as I wanted to compare apples to apples. My personal opinion for some time is that efficiency on Kaby suffers once you get much past about 65°c. If you can keep temps under that, then major performance gains can be had. To prove the point.. I did start playing with the voltages @ 50x, as Justin wants a 5GHz daily, so those are the important numbers. I tried again at 1.20v but the test failed about 5 minutes in, so I bumped it back up to 1.21v. OF COURSE, RESULTS WILL VARY ACCORDING TO YOUR INDIVIDUAL CHIP, BUT A 15-20°C IMPROVEMENT IS A REASONABLE EXPECTATION FROM MOST CHIPS. You may notice my delid tool is somewhat scarred, its done a bit of work. As it wears, the front of the silicon lifts higher.. watch carefully as the vice is closed. This never used to happen.. I usually just hold it down with my thumb on the bench vise, but I need both hands with the portable vise. Keeping it flat is necessary, it might be time for me to invest in another tool. I'm actually thinking that might be a reason for the underwhelming noise when it popped. The crap on my hands is what happens when liquid nitrogen contacts skin..
You can find a screenshot of this in post #43. Top_cat2, Hotrod2go, BurningFeetMan and 1 other person like this. direct core with liquid metal ive been doing it for years now. Even on my gpu's. Is it worth delidding if you're on a big chunky air cooler? Im currently 4.8 on my 6700k chip on auto settings for voltage. Seems to be stable with temps around 30-40 at idle. I just wish I'd checked to see if the video had a time limiter. I'd have done the video in two parts. Instead, I did half of the video in front of a camera that wasn't rolling lmao. I'll do it again, properly, the next time I do a delid. I might add it to this thread as well when it happens. IMO any cooling advantage you can get is a good one. CPU's work better when cooler, great when cold, and unbelievably fast when they hit it with LN2. Cooler is always better. Idle temps don't change by a huge amount really. Delidding comes into its own when you start working the chip hard. It would lower your temps by just as much as it did with the AIO cooler I used, generally speaking. What temps do you get when benching, or gaming? If you are ok with the performance, and ok with the temps, and ok with the fan noise, then delidding is not for you. Remember, although the cooling advantage is excellent, the CPU warranty is potentially voided by this procedure. If you are happy with what you have, I'd leave it at that. It's amazing to see what was a very underwhelming purchase (I very much considered returning it and swapping platforms) change in the space of hours thanks to you. As you mention, a nice 50x at reasonable voltage was the goal for me, and it's amazing to see that happening at what my board (Z270X Gaming 8) calls stock volts (1.22). I managed to wind the voltage back to 1.16 with the stock chip, but it was still a hot mess. Can't thank you enough mate, the service is excellent. 11/10, do recommend! I had thought it to be fairly common knowledge that delidding was required to get the most out of these chips, but there's always going to be people that are sceptical, can't justify the risk or are just to anxious. I've now moved the chip into another rig. Its this one.. more info on the link in my sig. Basically a better mobo, the Asus Z270i Strix, with a proper custom loop (D5, Raystorm Pro, and 280mm rad). Level up.. Ambient remains unchanged @ 19.3°c (heated room). Background has changed because I'm now on a different rig, and with more screen real estate (the 'laptop' is 720P, the main rig is a 1080P TV). Nice info there Kev. As you know, I've been doing this for guys in here, and every chip behaves like a different animal after. Some only benefitted by 10degrees, one had a 28degree difference. It really is worth the trouble IMO. How cold is it at 3am for you Kev? Quit messing with stability testing and hit the benchmark button. I can't find the newer 7th gen thread for this but Intel have warranted delids in the past which is never bad. Jokester nailed it however, "Your mileage may vary!" Im interested in delidding. Warranty is meh as I upgrade before parts stop working. Having said that, I would not attempt to do it myself as I have zero experience. Anyone about Sydney who have done it numerous times/is confident and will do it for some $? It's even easier now to delid with specialized tools you can buy. I did mine with the trusty blade and cut the glue method. Yep, used a razor blade and NTH1 myself many times. I always felt more comfortable with a blade than a hammer This time it was a 3d Printed delidding tool made for me by MortarArt from this forum. The silicone wafer is just getting too thin and delicate on Sky/Kaby for the old methods. The liquid metal I've only been using the last year or less, but I've done a couple dozen chips with it. Its astonishing stuff compared to anything else in a delid. I used Kryonaut between IHS and water block, I won't be doing so again. I got 2 applications from my 1G tube... and I personally think there is no real difference, so NTH1 remains my choice for that. For underneath the IHS though, the liquid metal Conductonaut is awesome. Don't attempt to use liquid metal on top, it is highly corrosive to aluminium and remains a liquid, so compressing it with a heat sink isn't going to end well. Yep, used a razor blade and NTH1 myself many times. I always felt more comfortable with a blade than a hammer :lol. From the old AMD's I used a blade from a disposable razor/shaver as they are really thin. These days the hammer is faster and safer I think. 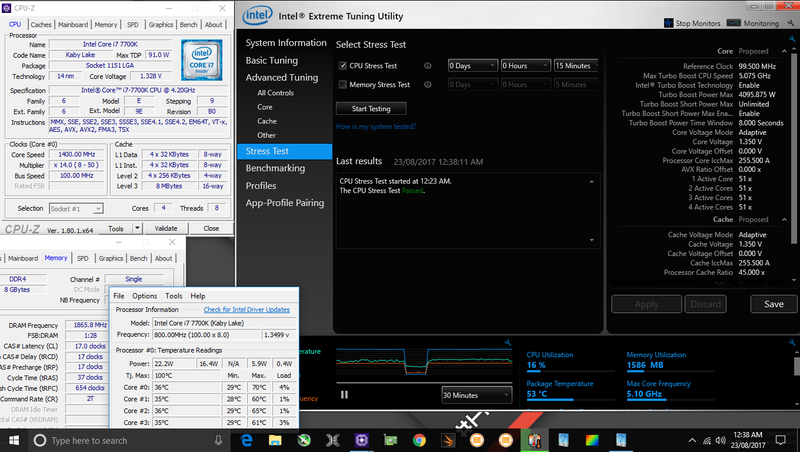 I did my 7600k a few months back, I didn't properly test the difference but it seemed to be about 10-15C. You've got me thinking now though, to get to 5GHz with my Cryorig H5 I had to use 1.34V (from memory, will have to check when I get home). Ambient when stress testing was around 30C with temps getting up towards 80C. Maybe I should get an AIO so I can wind the voltage back. My personal opinion, via observations on many chips, is that Sky and Kaby, Kaby in particular, both prefer to be under 65°c, despite the much higher actual TDP. If you can get your desired frequency at below 65°c first, then you can start knocking the voltage down considerably in my experience. 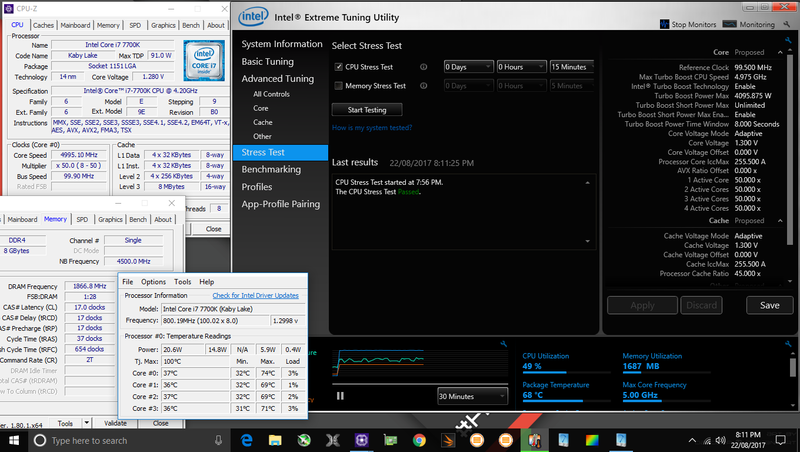 did my old 6700k a while back and dropped it by 19 degrees , if you can i highly recommend.